"Something was very wrong. Here was this guy from nowhere, and he kept going around the board and hitting the bonus boxes every time. It was bedlam, I can tell you. And we couldn't stop this guy." For the contestant, the show’s catchphrase, “Big bucks, big bucks, no Whammies!”, had just come to fruition: in an era where no single contestant ever won more than $40,000 — not even those competing on the ever-popular The Price In Right, or Wheel of Fortune — Larson had earned $110,237 ($253,000 in 2015 dollars). And in achieving this, he’d overcome insurmountable odds...or had he? While CBS executives in the control looked on in horror and disbelief, Larson harbored a secret: he’d cracked the code of Press Your Luck. For months, he’d studied the show’s game board, which lit up squares in a supposedly “random” sequence, and found that, in actuality, it was repeating the same 5 patterns over and over again. What ensued was one of daytime television’s strangest moments — one that exposed the follies of both man and technology. 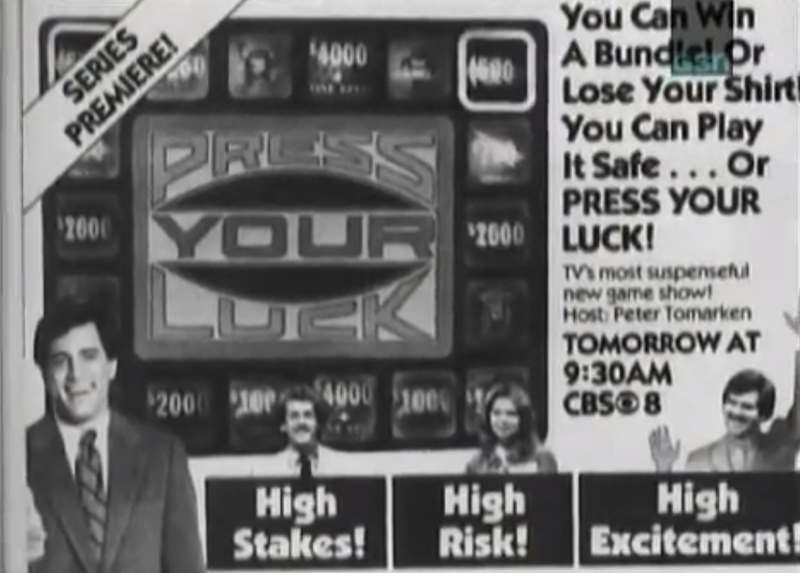 In September of 1983, a flashy new game show called Press Your Luck hit the daytime broadcast on CBS. The brainchild of two veteran television producers, it was billed as the most “technologically advanced” program of its kind; utilizing cutting-edge audio-visual equipment, it tempted viewers and contestants with enticingly large payouts. This Big Board was made up of 18 backlit squares, each containing a constant rotation of various cash and item prizes, as well as a selection called a “Whammy.” When a player’s spin began, a selector light rapidly bounced around the squares, lighting them up in a seemingly random sequence; the player would then choose when to slam down a big red button, stopping the board. Whichever square was lit up dictated the player’s fate for that spin. 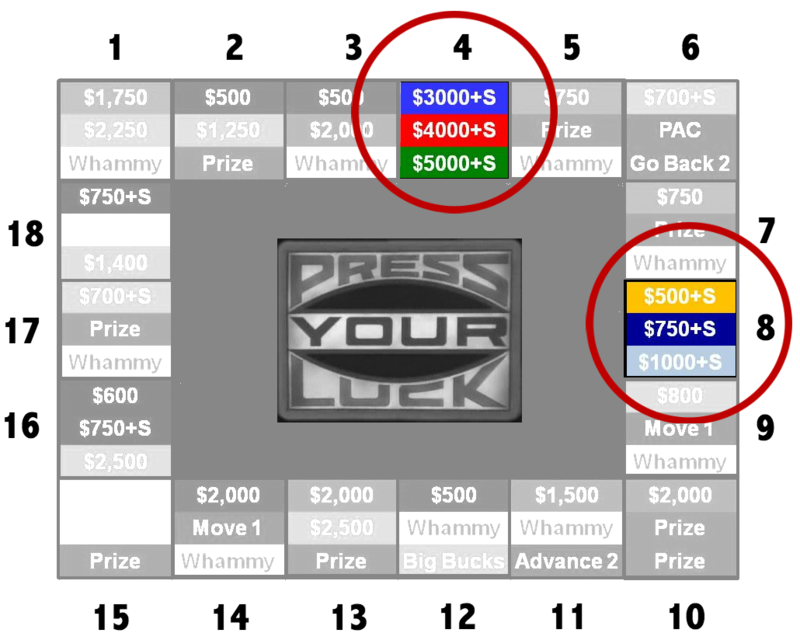 At the end of each spin, the player either had the option to “press his/her luck” (spin again) or pass any remaining spins to the next player. The board contained a wide array of outcomes: cash amounts ranging from $500-$,5000, vacation packages, material prizes (boats, appliances, etc. 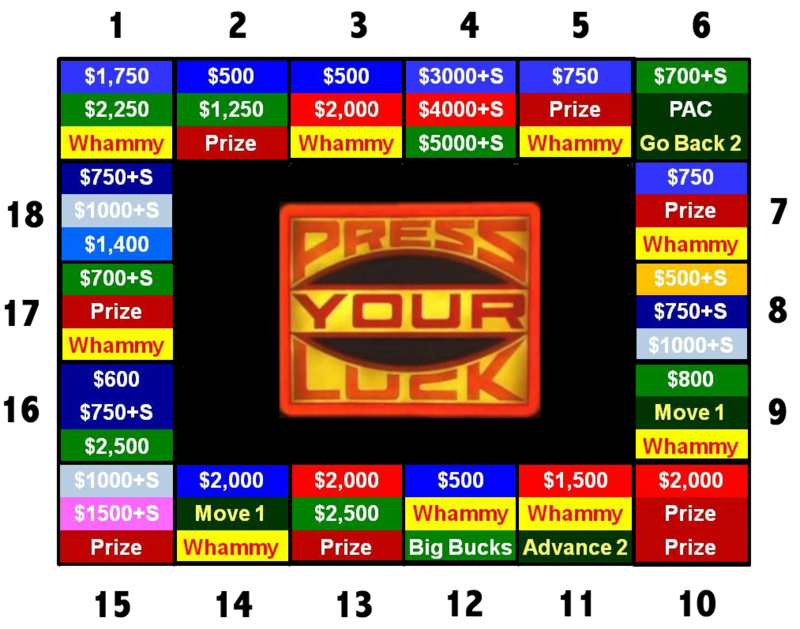 ), “Pick a Corner” (in which the contestant would select any corner square on the board), various instructions (“Go Back 2,” “Move 1”), and finally, the Whammy. If a player landed on this dreaded tile, an annoying animated gremlin in a red suit would come out and reap the player of every cent he/she had amassed. Many of the cash prize squares on the board also contained an extra spin (+S). 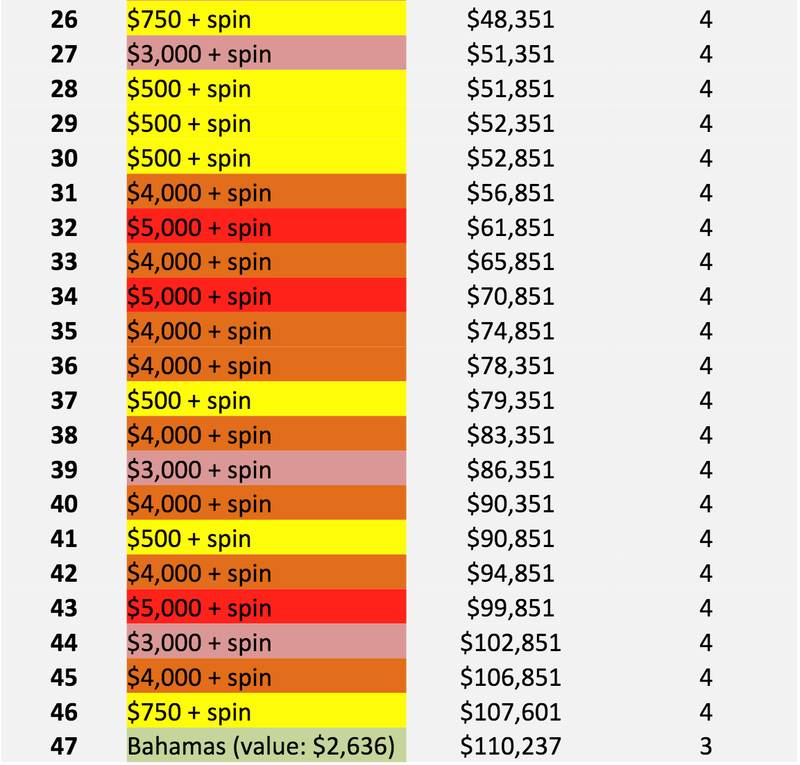 Hypothetically, this made it possible for a player to continue on indefinitely, assuming he/she consistently landed on the cash+spin squares — though the show had made certain that the odds of this occurring were nearly impossible. Of the Big Board’s 54 outcomes (18 squares with 3 rotating options each), 9 were a “Whammy.” That meant that, on any given spin, a player had 1 in 6 odds of losing everything. What’s more, the team that had programmed the board was confident that both the speed and “random” nature of its sequences would prevent contestants from winning more than $25,000. Over the first few episodes, the average winnings hovered around $14,000. 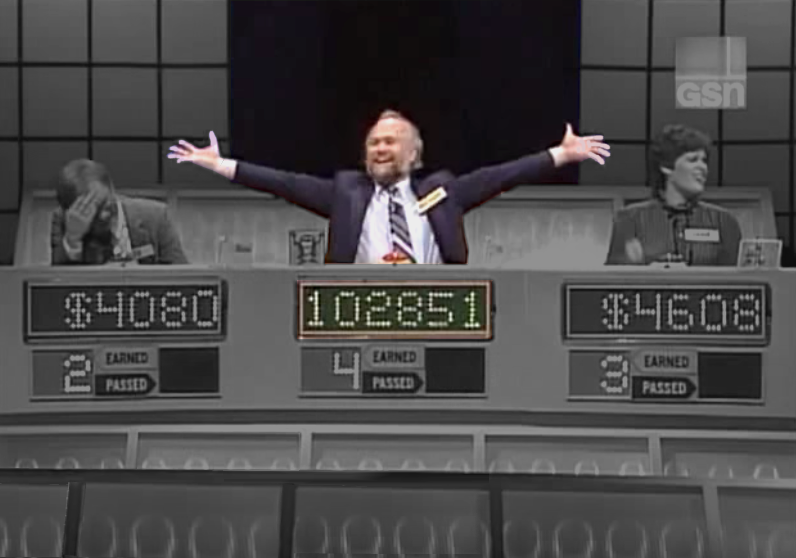 In the words of former CBS executive Ron Schwab, Press Your Luck was “like the Titanic — it was the technological marvel of its time.” Unfortunately for CBS, and iceberg loomed, and its name was Michael Larson. Michael Larson was never interested in following the rules. The youngest of four boys, he was born in 1949, somewhere between Cincinnati and Dayton, Ohio. By middle school, he’d established a lucrative enterprise smuggling candy bars into his gym class and selling them at a considerable mark-up. While tenacious and intelligent, he was always looking for a quick, easy way to get rich. Instead, Larson invested great amounts of time seeking out loopholes and taking advantage of them, often illegally. In one instance, he found a bank that gave out $500 for starting a new checking fund; using fake names, he opened dozens of accounts, waited the minimum necessary duration, then withdrew the money. On another occasion, he registered a business under a family member’s name, hired himself as an employee, then fired himself to collect unemployment benefits. Throughout his 20s and 30s, Larson only intermittently found real work — first as an air conditioner mechanic, and later, an ice cream truck driver — all the while graduating to more intensive ploys. He began to spend every waking minute in front of a television, watching infomercials and game shows, in hopes of identifying some kind of opportunity to get rich quick. 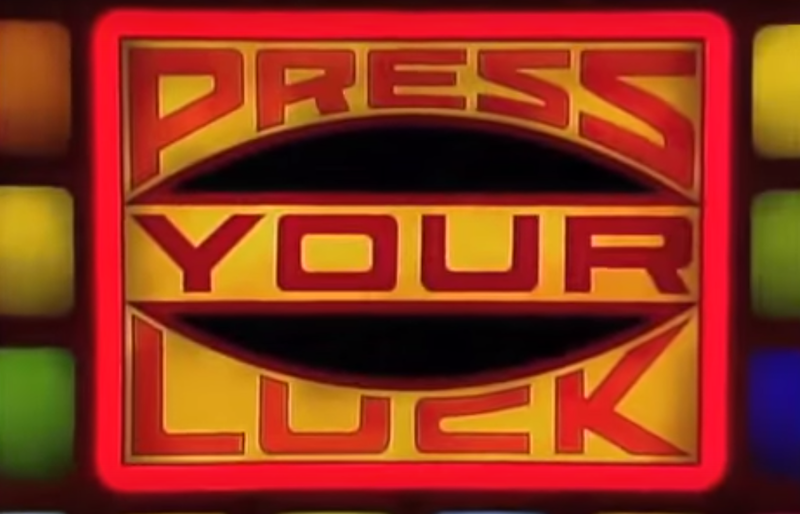 After determining that more popular daytime game shows like The Price Is Right and Wheel of Fortune were un-hackable, Larson began to focus on a relative newcomer: Press Your Luck. Using his VCR, he recorded episodes; for 18 hours a day, he sat perched in front of the screens, analyzing every spin of the Big Board frame-by-frame, looking for patterns. Then, incredibly, he found one. 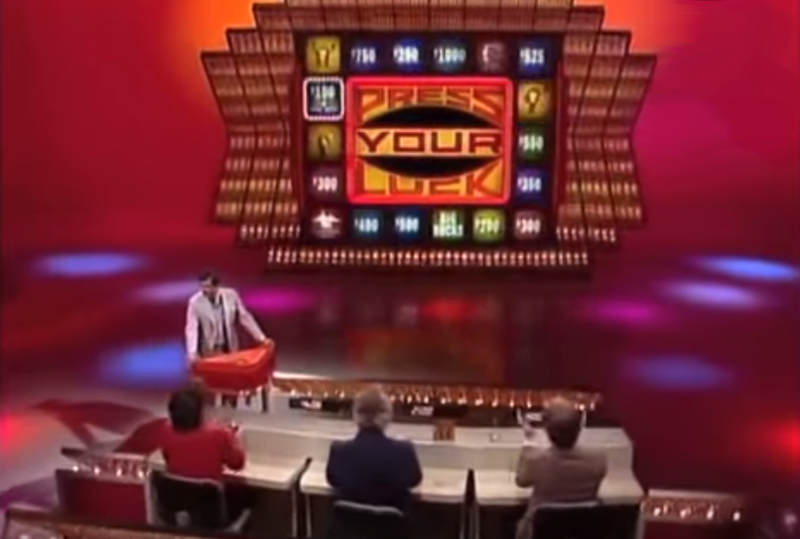 After six months of scrupulous examination, Larson realized that the “random” sequences on Press Your Luck’s Big Board weren’t random at all, but rather five looping patterns that would always jump between the same squares. He wrote down these patterns, memorized them, then honed his timing by watching re-runs and hitting “pause” on his VCR remote when he suspected the board would land on a given square. Larson was ecstatic. He’d uncovered a flaw in the game, perfected his technique, and, in his opinion, possessed the ability to amass a fortune. There was just one thing left to do: he had to finagle his way onto the show. Armed with little more than the address of CBS Television City, Larson spend the last of his ailing funds on a bus ticket from Ohio to Los Angeles, with the intention of auditioning for Press Your Luck. Despite Edwards’ doubts, Larson, an ever-enterprising schmoozer, managed to convince Bill Carruthers, the show’s executive producer, that he was a small-town plebeian desperately in need of a chance to win some money. Always in search of a good sob story, the network agreed: Larson was slotted to appear on the fifth taping of the day, May 19, 1984. On the day of filming, Larson arrived early. Dressed in a cheap suit jacket and a shirt he’d bought for 65 cents at a thrift store, he exuded the intense confidence of a man preparing to go into battle. His competitors, Ed Long (a Baptist minister) and Janie Litras (a dental assistant), were completely oblivious to their impending doom. Larson got off to a rocky start. On the very first question ("You've probably got President Franklin D. Roosevelt in your pocket or purse right now, because his likeness is on the head side"), he buzzed prematurely and yelled, “$50 bill!” (the correct answer was, of course “a dime”). For the remainder of the question round, he sat silently, with a perplexed look on his face. Eventually, he finished with 3 spins, putting him in last place behind Long’s 4 and Litras’ 10. Since he’d come in last, the rules dictated that Larson spin first. This did not go well: on his very first spin of the board, he hit a Whammy. However, he quickly recovered: hovering his hands just above the buzzer, he intently watched the light travel around the board, and, recognizing the patterns, hit square #4 ($1,250) on his second and third spins. In round two, Larson came to life. During the second question round, he managed to correctly answer three questions, bumping his total spins up to 7; since he sat in last place, he again spun first. With his first two spins, he landed on square #4, earning him $4,000, and $5,000. Then, over 10 ensuing spins, he proceeded to rack up $29,351 in winnings without hitting a Whammy. The audience roared with excitement, yet Larson seemed unsure of himself. 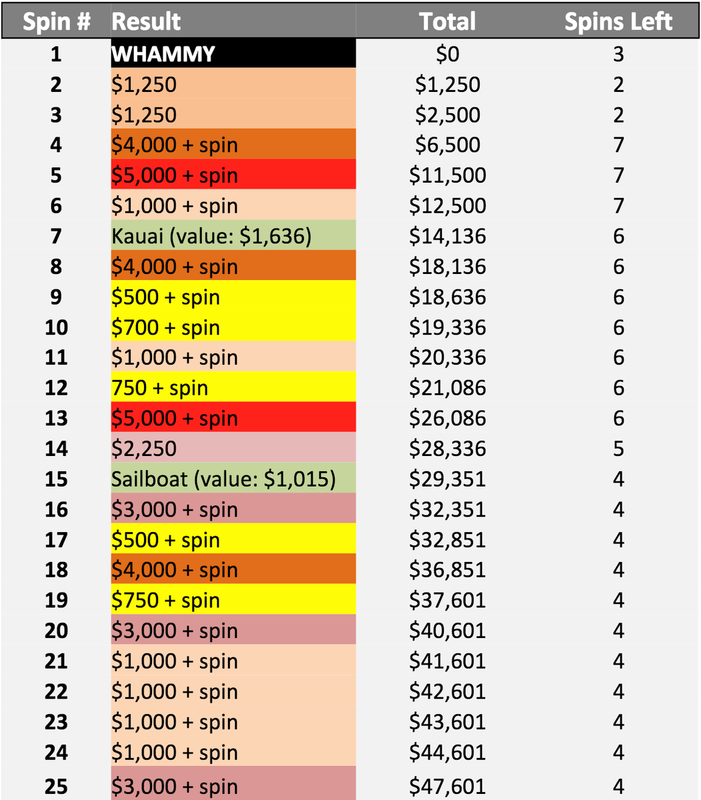 While he was aiming to hit squares #4 and #8, he missed his mark four times during this period of play, unintentionally landing on #7 (a trip to Kauai), #17 ($700 + a spin), #6 ($2,250), and #7 again (this time, a sailboat). During Larson’s rally, Tomarken, the show’s host, grew increasingly nervous. His quips graduated from shock (“We’ve never seen this happen! You’re on a roll!”) to disbelief (“This is unreal”), to utter disgust (“You’ve got to be kidding me”) — and once Larson hit the $30,000 mark, he started pressuring the contestant to bow out. Finally, 40 successful spins and $102,851 later, Larson passed his final 3 spins to Ed Long, fearing that he was beginning to lose focus. On his very first spin, Long hit a Whammy and lost all of his cash. When the spins were passed to Litras, she too hit a Whammy on her first try. In the hopes that Larson would screw up and lose his cash, she then passed the spins back to him, but Larson did not falter. Instead, he landed $4,750 and a trip to the Bahamas. When the game ended, Larson raised his arms in triumph and emitted a primal scream: he had secured $104,950 in cash, a sailboat ($1,015), and two all-inclusive trips, which brought his total winnings to $110,237. Ed Long distantly trailed in second place with $11,516 (which he'd earned in a prior episode as a returning champion), and Janie Litras left with $0. Larson had made a fool of CBS: He'd spun the show's board 47 times. He’d won more than any other daytime game show contestant in history. And he’d done so by finding an inherent flaw in television’s most “technologically impressive” game board. While Larson celebrated on stage, the powers that be at CBS sat dumbfounded and deflated. Statistically, it was extremely unlikely that Larson had simply gotten lucky. Given the 1 in 6 odds of hitting a “Whammy,” the probability of going 45 spins in a row without hitting one was (5/6)^45, or .027%. Larson had beat odds of roughly 3 out of 10,000. Despite this, Tipton saw nothing illegal in Larson’s play: he wasn’t visibly breaking any rules, and she could do nothing but helplessly stand by and watch him dominate the show. After Larson’s win, the “Big Board” was re-programmed: its 5 “random” patterns were expanded to 32, and the control panel was replaced by a PC running a far superior randomizer. Larson's streak had gone on so long that CBS had to split the airing into two half-hour segments; the network was so thoroughly embarrassed by the board's flaw that they only aired the episodes once. In September of 1986, just two years after Larson's Press Your Luck appearance, the show was cancelled. But a few months later, while listening to the radio, Larson heard about a contest he just couldn’t resist: the show read a serial number on air every day, and if a listener could match that number to a $1 bill, he would win $30,000. Larson visited five different banks, withdrawing nearly $50,000 in $1 bills. Then, over the course of two weeks, he analyzed every bill in hopes of winning. A match never came, and Larson, who’d grown lazy by then, resolved to just leave the bills in his home. This didn’t work out too well: one night, he left to Christmas party and came home to a kicked-in back door. All the money was gone. This was the beginning of Larson’s downward spiral. Teresa Dinwitty, then Larson’s common-law wife, recalls then that aggression mounted to such a level that she feared for her life. She fled with her children and demanded Larson leave her house. Eventually, Larson moved to Dayton, Ohio, where he assumed a role as an assistant manager at Walmart, but this didn’t last long. He grew disillusioned with his minimal pay and, after meeting another woman, launched his next venture: a massive Ponzi scheme. Under the name “Pleasure Time Incorporated,” Larson sold shares in a non-existent American-Indian Lottery, and, by the mid-1990s, he’d managed to cheat 20,000 investors out of $3 million. With the SEC, IRS, and FBI hot on his tail, he fled Ohio and disappeared into the void. 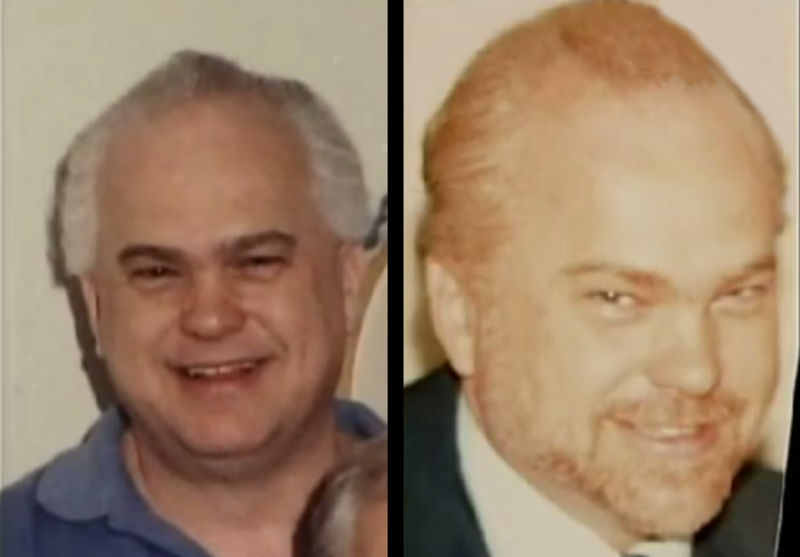 When investigators finally tracked Larson to Apopka, Florida in 1999, he’d succumbed to throat cancer. But it was also a feat that brought out the best in a man who was otherwise a delinquent: Recognizing the board’s flaws required keen observation skills. Mastering the timing of the generator took a unique combination of patience, dedication, and can-do mentality. And performing under pressure in front of a live studio audience demanded a special breed of composure. 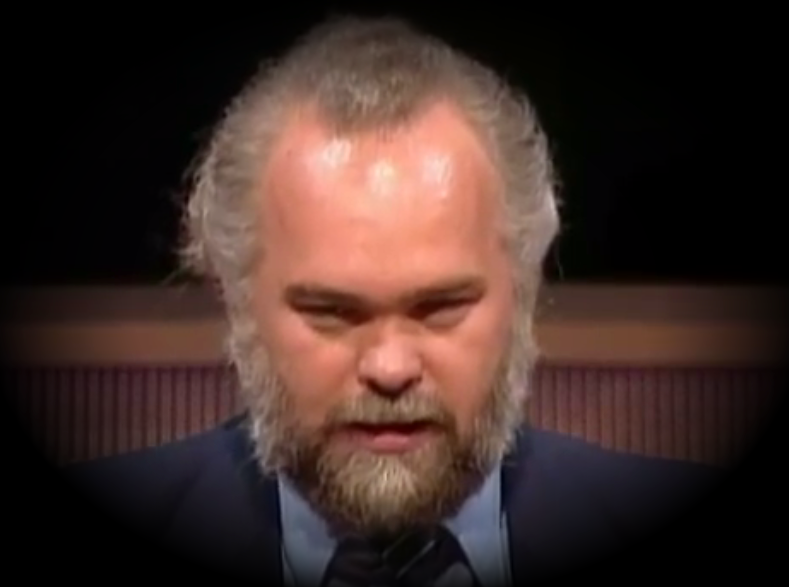 In many ways, “gaming” Press Your Luck was the most honest endeavor Michael Larson ever undertook. For our next post, we explore the probability of marrying a co-worker. To get notified when we post it → join our email list. An earlier version of this post first appeared September 14, 2015. Note: Priceonomics can help your company get better at creating content marketing that actually performs. Software, training and content creation services from Priceonomics. Starting at just $49 / month.